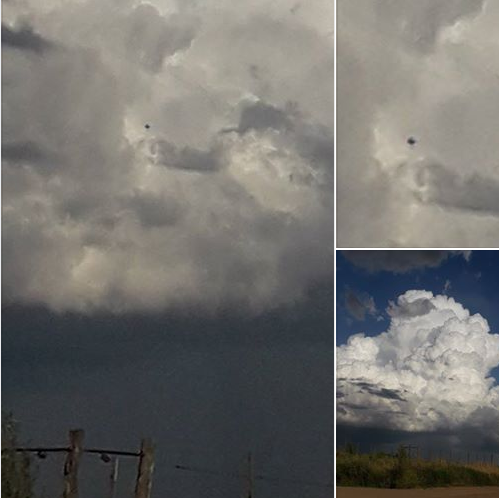 Guillermo Giménez of Planeta UFO writes: "Nicolás Alarcón, the protagonist of this event, sent me these three (3) images of a strange object seen last Sunday at 5 o'clock in the afternoon. The location: Province of Buenos Aires, vicinity of Tres Algarrobos, a town of 3000 residents. The images were obtained with a J7 mobile phone. The witness says he was all alone in the middle of the countryside." "Nicholas Alarcon, the protagonist of this event, sent me these three (3) pictures of a strange object seen last Sunday at 5 PM. Location: province of Buenos Aires, neighborhood of Tres Algarrobos, a city with 3,000 residents. Images were obtained using a mobile phone J7. The witness said that he was alone in the middle of the countryside".